You really have to give it to the geniuses at Pixar. Movie after movie, they manage to churn out the most lovable and endearing characters, pen the most beautiful stories, and produce the slickest movies without missing a beat. Count them -- 9 movies to date, and not one of them deserving of any serious criticism. OK, so Cars was a relative disappointment compared to the other greats, but still, it stands as a pretty decent movie and is still miles ahead of the plethora of crappy children's movies around! I loved the way Pixar put so much effort into bringing life to the characters. Think about it -- the characters in Wall-E are CGI-drawn robots rendered in massive server farms. They don't have real human voices behind them. They don't even look vaguely human!! Does he remind you a bit of Johnny from Short Circuit? Sure, we could marvel at the gagillion-bytes and thingamaflops of computing power that went into rendering the movie to absolute perfection. We could step back and be amazed at how many light years ahead the CGI is from Pixar's early days. But that would be missing the point. 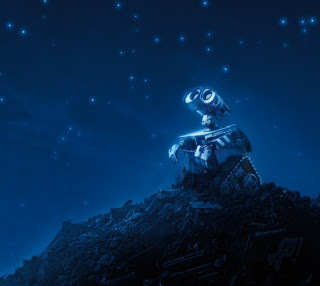 Wall-E and Eve are the representation of all things human -- and they are so *much more* human than the many cardboard-thin 'real' characters in so many human-acted movies!!! Yet, it is not 'just' a fun movie about friendship and first love. Behind that story is a message of the danger of unbridled consumerism. Of people who have traded in a real life for convenience and creature comfort. Of loosing sight of Mother Nature... until eventually losing Mother Nature. Of Man's arrogance which then led to the total destruction of his home planet. But it is also about the all-redeeming hope. All of that is wrapped up in a nice package without being over preachy or moralistic. Good fun, a warm-fuzzy and something to learn from. What more could you ask for? Pixar's productions are the best! We have to wait till 18 Sept here, but yea, definitely going to watch! All other movies uses animation to tell a story. Pixar tells a story by using animation. 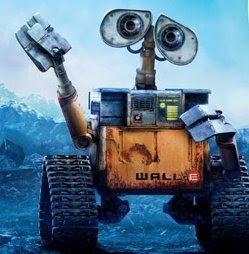 I just watched Wall-E. At the scene when Wall-E and Eve.... ops better not say further until cc watched it! Heh, know what you mean. This movie makes you want to talk about it... but yet have to keep our mouths shut - lest it becomes spoilers for others! even though the animation does not have a lot of scripts, but the action tells the story so well. sometimes, robots are more human that people made of flesh! don't u think so? definitely a must see movie of the year! Hi Kupo, yeah, some times a lot more things are spoken when nothing is said! its very interesting movie. the animated used are great and advanced too.